Would stay again if the need arises. Good gym, pool and activities. Breakfast preparation was a little slow, only one cook at buffet. 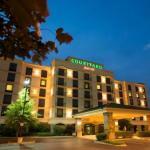 The 150-room Courtyard by Marriott Louisville Airport is located next to the Kentucky Fair and Exposition Center and adjacent to the Six Flags Kentucky Kingdom. The six-story, non-smoking property provides quality accommodation at an affordable price for both the leisure and traveler and is only minutes away from the airport. There is a complimentary airport shuttle which operates around the clock. Other items included with the room rate are high-speed Internet access, local telephone calls, a morning newspaper, parking and coffee available in the lobby 24/7. Area landmarks and attractions include five golf courses, Waterfront Park, Louisville Slugger Museum, Louisville Glassworks, the Muhammad Ali Center, the Jim Bean Distillery and Churchill Downs, home of the Kentucky Derby. All the rooms, and six suites, have a well-lit work desk with high-speed Internet access, television with cable movie and news channels, pay-per-view movies, wet bar, pullout sofa bed, alarm clock, tea and coffee making facilities, iron and ironing board, hairdryer and two-line telephone with voicemail and speakerphone. Video games and players are available for rent. This hotel has an indoor swimming pool, whirlpool and a fitness center. The Courtyard Café is only open for breakfast. Restaurants nearby include a Bob Evans, the Cardinal Hall of Fame Café, McDonalds, Cracker Barrel and a Taco Bell. The 24-hour front desk has safe deposit boxes, information on local events and attractions and a list of restaurants that will deliver to the hotel. Other amenities include a full service business center, valet dry-cleaning and vending machines. Families who stayed at this Courtyard said the location was great, close to the Six Flags theme park, and the employees were friendly, efficient and full of information on places to visit. The rooms were spacious, with a sitting area, and the rates reasonable. Those who craved a midnight snack said the 24-hour on-site The Market was a good amenity. Most clients said they would return to this hotel on future visits to Louisville and said they would recommend the property to others.